The article explains about the requirements of CGST Act and corresponding CGST Rules with respect to GST audit provisions as laid down in the law. The Goods and Services Tax was introduced in July 2017 across nation. Various provisions of the law are still being revisited and modified by the Government as and when found required. After one year of its inception the assesses are now in a position to understand the law well and implement it fully across their business houses and trade lines. Now the time has come for the applicability of one of the most fundamental provision of the law i.e. “Audit under Goods and Services Tax”. The clock has started ticking and the assesses are getting prepared for the activity. 1. What is GST Audit as per Goods and Services Tax? Sec 2(13) of the CGST Act 2017 defines the term audit as mentioned below. – and to assess his compliance with the provisions of the GST Acts or the rules made thereunder. The above definition can be divided and studied in two different parts i.e. What is to be done in GST Audit and What is the Purpose of GST Audit. √ Whether duty(GST) has been rightly paid? √ Whether credit(Input Tax Credit) has been correctly taken? √ Whether records/ documents has been correctly maintained? √ Whether returns have been accurately filed? √ Whether exhaustive reconciliations of supplies and purchases are in place? As per Sec 35 of the CGST Act 2017, every registered person whose aggregate turnover during a financial year exceeds Rs. 2 crores shall get his accounts audited. The law has given equal rights to the professionals , hence a Chartered Accountant or a Cost Accountant can do the GST audit of the eligible assesse. The registered person shall submit a copy of the audited annual accounts along with the copy of reconciliation statement. The reconciliation statement here includes the statement reconciling the the value of supplies declared in the return furnished for the financial year with the audited annual financial statements , in terms of Sec 44(2) of the CGST Act 2017. Place of conducting audit – at the place of business of the registered person or in their office. Following detailed provisions have been laid done in the CGST Act regarding the GST Audit to be conducted by the Tax Authorities under special circumstances. This audit is exclusively done by CA/ CMA appointed by the Tax authorities. Sec 66(3) Effective notwithstanding that the accounts of the registered person have been audited under any other provision of this Act or any other law for the time being in force. then the AC may direct a Special Audit to be carried out by a Chartered Accountant or a Cost Accountant nominated by the Commissioner. * Determination of tax not paid or short paid or erroneously refunded or input tax credit wrongly availed or utilised for any reason other than fraud or any wilful misstatement or suppression of facts. ** Determination of tax not paid or short paid or erroneously refunded or input tax credit wrongly availed or utilised by reason of fraud or any wilful misstatement or suppression of facts. ICAI has issued sample formats for conducting GST Audits covered in the above laid done sections. Though the proposed formats are yet to be finalized but they have been circulated across various websites and are being studied by the various professional firms for their use. There are Form GSTR 9C & GSTR 9D Form GSTR 9C is like Form 3CA of Income Tax Audit and Form GSTR –9D is akin to Form 3CD of Income Tax. Whether duty(GST) has been rightly paid? Whether credit(Input Tax Credit) has been correctly taken? Whether records/ documents has been correctly maintained? Whether returns have been accurately filed? Whether exhaustive reconciliations of supplies and purchases are in place? There can be various subdivision of the above categories i.e. an auditor might have to look into various provisions of the law for ensuring all the compliances. In fact the documentation proposed by ICAI(more than 50 page report) consists of all these provisions. Needless to say that an auditor has to keep his eyes and ears always open and has to work diligently to in the interest of both parties i.e. assesse as well as revenue. In this way he has to complete his task in an exhaustive manner covering each single aspect of the provisions mentioned under Goods and Services Tax Act. 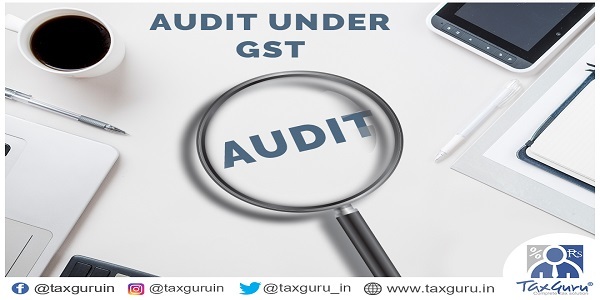 An audit has always been an integral part of any tax structure and so is the case with Goods and Services Tax. It is an irony indeed that despite of the provisions of GST Audit in place since last one year, there is a big ambiguity in the process of audit to be conducted by the professionals. There are no clear cut instructions issued by the Government of India in this regard, neither the formats have been finalised nor any official notification has been issued regarding the audit report. Its high time the Government should realise that for achieving the effective results of implementation of such a big tax reform, the effective preparations should have been done well before time. Very nicely educative summarized compilation. What is the Turnover for FY 2017-18? 2 Crore including April to June or excluding? Good and specific article on GST Audit which give overall view. One can take a note of it.